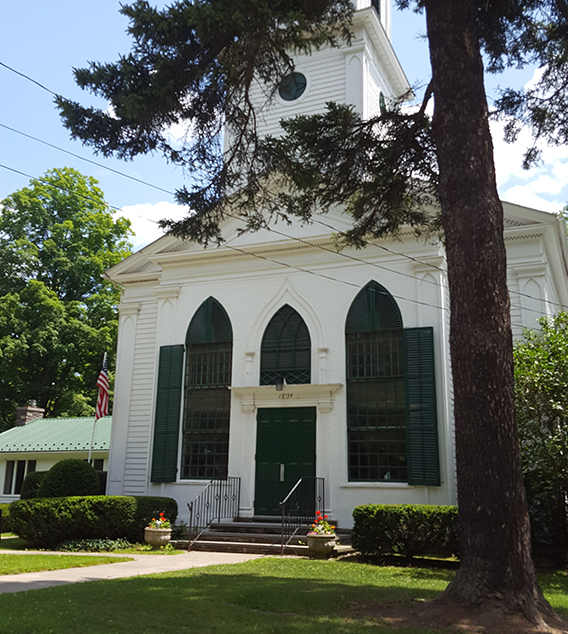 The Grange Hall was built in 1832 as Gilbertsville’s Presbyterian Church, the earliest church building in the village. It was built by the Rockwell brothers, a family of builders who moved to Gilbertsville from New England. Later generations of Rockwells continued as carpenters and ran a lumber business on Marion Avenue, next to the Empire Hotel, through the early part of this century. The Grange Hall is a pleasing mix of traditional New England meetinghouse design and the Greek Revival style which was popular in the 1830s. The clock in the steeple was probably installed around 1850. The Presbyterian congregation held services at the Hall until 1884, when it moved to new quarters. In February, 1889 the building was bought at auction by John Henry Gilbert. Four years later he gave it to the newly-formed Village Improvement Society for use as the Village Hall. Then in 1899, the Hall was turned over to the town and used as the Town Hall. In was after this time that the stage was added on the main floor, and a hand-painted scenery curtain was added in 1903. The pulpit of the original Presbyterian Church was removed and installed as a balcony on the second story of Oxbow House on Rt. 51 (now owned by the Simon family), and can still be seen there. The church bell was also moved to Oxbow, where it served as a horse watering trough behind the house. It was later moved to the Presbyterian manse for storage. n 1902, Major James L. Gilbert and Colonel B. C. Gilbert donated a gilded dome and weather-vane for the steeple, in memory of their parents. The weather-vane, which Maj. Gilbert named “Uncas” after the character in James Fenimore Cooper’s “The Last of the Mohicans”, stands almost five feet tall. Made by the J. L. Mott Iron Works of New York City, it was originally gilded like the dome. The weather-vane was toppled and extensively damaged by high winds in April, 1945, and many doubted that it could be repaired. Thanks in part, however, to the persistence and ingenuity of the then-Town Supervisor, the weather-vane was repaired and reinstalled two years later. One account of the repairs tells us that the weather-vane was given a new and stronger metal foundation. A steel shaft was passed from the Indian’s body down through the hub of a old car or truck, and then into the original wooden mast. The ball underneath the directional was created from a headlamp, also taken from an old vehicle. Two directional letters, E and S, had been destroyed, so new ones were cut from cook stove lids. Butternut Valley Grange bought the building in 1952, and it has served as the Grange Hall ever since. In the intervening years, the Grange has invested close to $100,000 in Hall maintenance and repairs. The Grange is now embarked on an extensive restoration project which includes preservation of the massive arched windows and painting the building’s exterior. Costs for the project are estimated at over $15,000, much of which is being funded through public dinners and individual contributions. The Grange was founded in America in 1867; Butternut Valley Grange was organized and held its first meeting on May 14, 1934. Traditionally, the Grange, like some fraternal orders, has been seen as an organization of secret members, with rituals that are closed to outsiders. But over the past eleven years, members of Butternut Valley Grange have spearheaded a movement to modernize meetings and activities, and open up the Grange to the entire community. Butternut Valley Grange has achieved nationwide recognition as a growing, exemplary and forward-thinking Grange. The changes we instituted here in Gilbertsville are now being copied in Granges around the country. We are proud of Butternut Valley Grange, and we invite anyone to attend our meetings and see what we are all about. We meet upstairs in the Grange Hall at 7:30 p.m. on the second Monday of each month. Put our next meeting on your calendar; we promise you interesting programs, music, singing and usually some good laughter, too!